Fayt is a noisy, bustling, cheerful port in the Middle Islands which welcomes anyone – elves, humans, trolls, neurotic magicians, goblins, pirates or smugglers. So it is easy enough for the odd evil-doer – a witch or shapeshifter, perhaps – to slip ashore too. 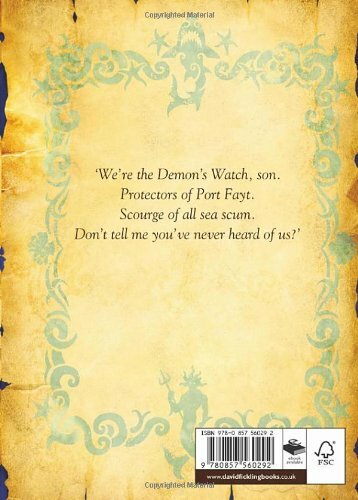 The Demon’s Watch (‘a Tale of Magic and Skulduggery’) is a noisy, bustling, cheerful story to match the port. Once the trouble-makers get to work, the pace is relentless and so is the clamour of insults, the clashing of cutlasses and the chases down twisting alleys and over dizzying rooftops. Young orphan Joseph Grubb is neither human nor goblin, but a bit of both; a Mongrel, in fact, as his brutal uncle, landlord of The Legless Mermaid, never fails to remind him. An unlikely hero (except in children’s books) to get mixed up in desperate deeds where the stakes are high. For there are those on the Mainland of The Old World who wish the generous-spirited town no good at all – they loathe Port Fayt’s racial mix. Even the welcoming town harbours some sinister denizens - there’s Slik, the two-faced message fairy, for example - and a malevolent, sniggering ginger cat. Even Fayt has an underworld where exotic dangers lurk - at one point poor Grubb finds himself sinking into the bloodstained waters of a seedy nightspot, Harry’s Shark Pit, without so much as a trident. Grubb and his new friends in the vigilante Demon’s Watch, including their newest recruit Tabitha, itching to exercise her expertise with her throwing knives, save the town this time; but the final chapter reports a warlike armada heading towards the Islands, promising more strife in Book 2.